Did you know they are rich in dietary fiber, folate, iron, magnesium, manganese, potassium, and vitamins A, B1, B2, B6, and C? It's true. A few summers ago I was wandering the farmers market and saw a pile of purple and gold beets overflowing a little farmer's table. I had never had beets before (unless you count the canned variety, which I always passed up thank you), and didn't really know what to do with them. So I prepared them like I would any vegetable I'm not sure what to do with...... I roasted them. Slice them up, toss in olive oil, salt and pepper, maybe a few herbs and roast them at around 400 or so until they are fork tender. They can be eaten straight off the pan, or tossed in to a salad. And did you know you can eat the beet greens!? Yes. Just saute' them in a little olive oil, or use them like you would any of your other greens. 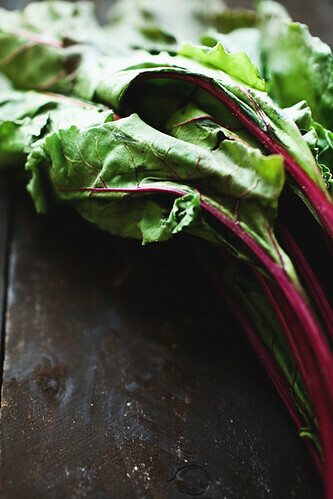 Beet greens actually have more iron and calcium than spinach.....so eat up! -bake at 350° for about 30 minutes. -remove when chips are crisp. Don't leave the room--they disapear too fast. We ate 3 beets in about 3 minutes. 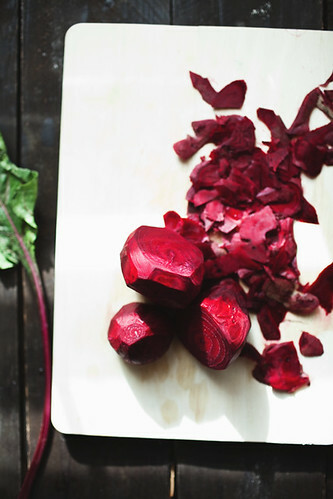 Beet juice can be used as a dye as well. Use it to color your Easter eggs this weekend. I've seen pasta cooked in beet water for pink pasta. this salad with goat cheese and avocado looks amazing. How do YOU like beets? I remove the greens, scrub them good and then boil until fork tender. Rub the skin off, slice, dress with some olive oil, red wine vinegar, salt and pepper. I can eat bunches of beets all by myself. So good warm or cold, alone or with goat cheese and salad. 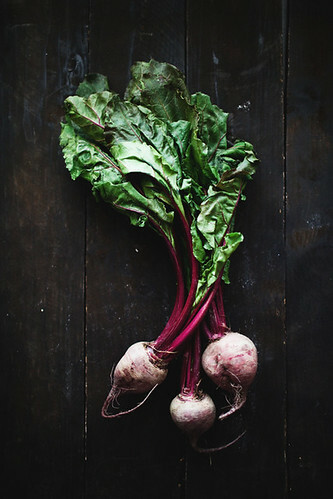 I love beet greens but I've never been a huge fan of actual beets (the texture gets me!) but I have to try these, I bet I'd love them. So, I thought of some others things I want to ask you/want you to blog about. Can I still say them? I'm so demanding huh? :) I would love to hear your alternatives to basics. Bread(buy or make? ), Cereal (do you eat it? ), Yogurt... etc. delicious! I rarelt buy beets, but you've inspired me! Very awesome ideas. I'm in. 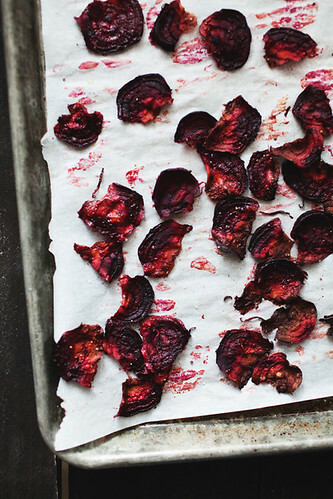 I haven't tried roasting beets, but now that I think of it......that would be delicious!!! Thanks for the inspiration! We are very much a BEET loving family!! Every year I plant 2 large rows of beets...we usually just boil/steam them and serve them as a side dish along side grilled salmon. My kids just love eating them plain with just a little salt/pepper. Last year we topped many a salad with steamed beets as well. I love that they keep through the winter and so this winter we made up Beet Borscht Soup a few times...WOW, was it ever yummy!! My kids were sad when our beets were all gone as they loved and wanted more of that soup! I'm excited for the weather to get warmer to get our garden growing...garden beets, garden carrots spinach, Swiss Chard and squash are my FAVORITE things to plant and grow and I'm glad my family never tires of them!! 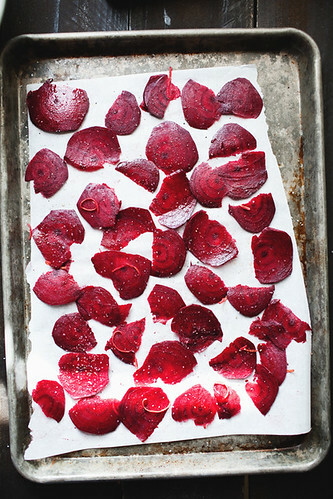 I can't wait to try making beet chips...my kids would think those are awesome (especially my oldest). BTW...along the lines of eating the beet greens (which we love and always cook up), you can also eat RADISH TOPS and make them into a Radish Top Soup...It is SO good! I found this out last year as we had SO many radishes and I hated to waste the beautiful green tops and so I did some searching and found a really yummy recipe to turn them into a healthy soup!! I know that you don't like to waste either and you do like to grow radishes, so I thought you may enjoy that helpful tip as well!! Thanks for being so awesome and for all of the great tips, yummy recipes AND family fun you share with us! Have a great week! i like them best roasted, in soup, or in potato salads. I will eat them any way at all, but my absolute favorite is to pickle them, then layer 3 slices with 2 thin slices of chevre, drizzle a bit of balsamic reduction over the top, and then sprinkle some chopped pistachio nuts over the stack. Very elegant and the play of texture is fantastic (but not for texture-phobes.) 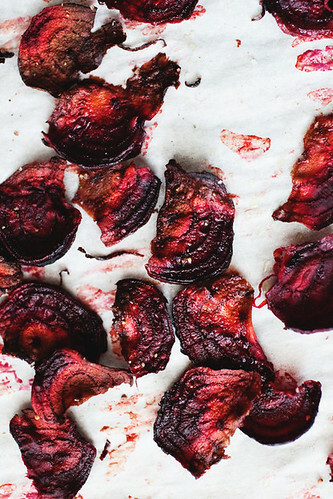 Trying the beet chips this weekend for sure! Gracias! mmm, beets are my favourite! ok, one of, since i have a lot of those. :) but i will definitely start eating the tops, now that i know how awesome they are! also, thanks for the cheek tint link - i'm very much for cheek/lip stains and tints, but i think makeup should be completely natural...this is on my to-do list for this weekend! i LOVE beets I just hate how murderous I look after cutting them ha ha. But I am trying these beet chips for sure, I mean anything made into chip form always seems more appealing. Can't wait to try these... do you mind if people pin your recipes. I pinned this but will delete it if you mind. I try to ask first but got too excited. I have stared at them every time my Grandma gives me some from her garden and been afraid to try them until now. Thanks for the ideas! Although I think I'm going to be trying the Golden Beets first - not brave enough to deal with the red dye aspect yet! Pickled eggs must be a guy thing, my husband makes some pretty rockin' pickled eggs every year at Easter! Your food and veggie pictures are amazing.... When are YOU going to do a cookbook?? I have loved every recipe I've tried of yours, and I am totally on the same page as you re: your commitment to eating good food and yet enjoying cake too. Love, love, love your blog - your writing style is terrific. What great recipes. Pinned the beet recipe awhile ago and was going to make it and happened to look up your soups. Wow.